Turn The Tables opened its doors in 2011, and quickly became a Northbrook fixture, beloved by our consignors and customers. We welcome a fresh mix of vintage, contemporary and modern styles into our 2,800 square foot space, always mindful of customer tastes and preferences. We love giving a second life to pieces of furniture, lamps, artwork, rugs and home accessories! Our specialty? Our staff members’ ability to spot a diamond in the rough, and help clients see the possibilities! A long time client, Jackie was arm twisted into joining Turn The Tables in May 2015. When she is not hard at work in the shop, staging, selling and websiting, she is busy showing off her new grandchild to the world! Chris, a resident of Northbrook for 24 years, began as a sales associate for Turn The Tables in April 2017. As a proud Mom of three boys, they have always been willing to re-arrange furniture when Mom asks! At our shop, Chris enjoys interior design work and staging the floor with all the wonderful pieces that arrive daily. In her free time, Chris loves to read, shop and stay current on the latest movies. Gayle was promoted from avid customer to Turn The Tables Sales Associate in May 2016. She loves eclectic furnishings and design. Her background is in museum education and cultural programming. She enjoys helping customers as well as hanging the artwork that comes into the shop. In her free time, Gayle works in her garden, knits, and walks her black lab around town. Cindy joined Turn The Tables in August 2017. Her longtime experience as an accountant and detail-oriented nature are a natural fit for working in a business which sources a myriad of products from a host of different locations. Cindy is able to wear many hats, is extremely resourceful and constantly displays a can-do attitude. 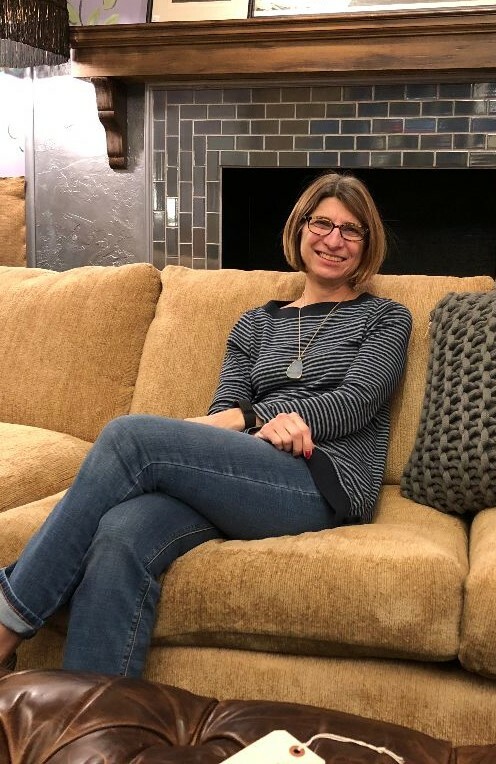 She also enjoys her new role of “apartment decorator” for her four children, from finding that perfect piece of furniture to personally sewing decorative pillows to match. When not in the shop, Cindy volunteers at Misericordia, enjoys traveling with her family, and is an avid runner and baker. Teri has been a resident of Northbrook for 21 years, and joined the TTT staff in October 2017 after being a dedicated browser for so long. She enjoys the customers and the concept of re-purposing furniture to new homes. While not at TTT, she stays busy in the volunteer world and being active outside. Ann Cariola is a long time design enthusiast and has spent many years helping willing friends and family organize and design their homes. Ann’s passion for design has been fueled by countless hours perusing design blogs, Pinterest, Instagram and watching HGTV! Ann loves to constantly rearrange and style accessories, a skill that she has already put to use at Turn The Tables. Be forewarned, if you ask Ann her design opinion, she will give you WAY more advice than you asked for! Besides her new gig at Turn The Tables, Ann is a Speech Pathologist and an Executive Function Coach. She is a proud mom of two boys and a darling new daughter-in-law. Ann moved to Northbrook 30 years ago from her hometown of Portland, Oregon when she married her husband John.